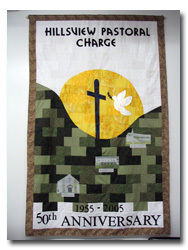 This year marked the 50th Anniversary of our Pastoral Charge. Events were held over the weekend at each point in the charge. Past Ministers and visitors joined our local congregations in the celebration activities. Birch River Brunch - 10:00 a.m. to 12:00 p.m.
Bowsman Tea/Coffee & Treats - 3.00 p.m. to 5.00 p.m.
Joint Church Service - 10:00 a.m. Followed by a potluck lunch at the Minitonas Community Hall.